It's Tuesday. And it's fall. After the crazy wind this past weekend, there are almost no leaves left on the trees now. This time of year always means I'm using my slow cooker way more, and the baking going on here increases exponentially. If my kitchen smells like something comforting for supper, I immediately feel warmer. Fresh bread is no exception to this. I love the smell of fresh bread at anytime of year, but it is even more incredible on a chilly, blustery day. That's why I chose to make one of my favorite Taste of Home recipes this past weekend. It's called "Mom's Italian Bread". 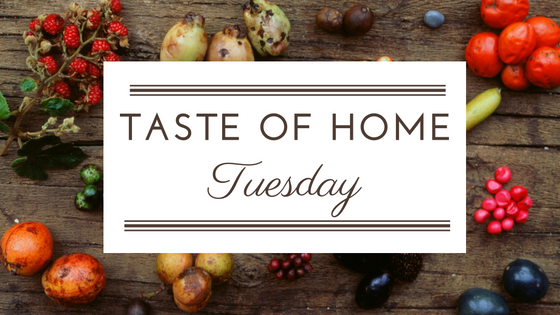 I'm sharing this for Taste of Home Tuesday this week, as hosted by Jolene's Recipe Journal. Check out what else is being shared at the bottom of this post! Let me start by saying that I have numerous favorite bread recipes. It depends on the day you ask me which one I'll claim to be my favorite. I use several that you simply stir and leave overnight. I have several whole grain ones. A pumpernickel one. A kaiser roll one. I think bread is quickly becoming my favorite thing to make. I love this one because it makes amazing garlic toast, a hearty sandwich, and a perfect dipping bread for soups or chili. I love it. The kids love it. Now, over the time I've been making this recipe, I have to say I've almost completely revamped the method to suit me. Why? Well, the short of it is that I find my method results in a much, much, much chewier crust, if that is what you're after. My preferred method results in bread so crusty after you take it out of the oven that you can actually HEAR the crust crackling as it cools. However, the inside remains so pillowy soft and delicious. I still use the quantities of ingredients exactly as written and have made this bread with the original method too. You can't go wrong with whichever method you choose. I've copied the recipe below,and have noted my changes to the method in italics. Happy bread baking! Punch dough down. Turn onto a floured surface; divide in half. Shape each portion into a loaf and dust with a small amount of additional flour. Place each loaf seam side down on a greased baking sheet. I place mine in a deep stoneware baking dish, which is sprinkled with a mixture of 1 tsp flour and 1 tsp cornmeal. If you don't have two of these, put the other in a deeper oven safe baking dish so that you are able to loosely cover with foil. Meanwhile, preheat oven to 400° (I know it's weird, but go for 500F). With a sharp knife, make four shallow slashes across top of each loaf. Bake 20-25 minutes or until golden brown. (I bake for 15 minutes, covered with a lid or foil. Then I uncover, reduce the heat to 400, and bake an additional 10 minutes until a nice golden brown). Remove from pans to wire racks to cool. Yield: 2 loaves (12 slices each). 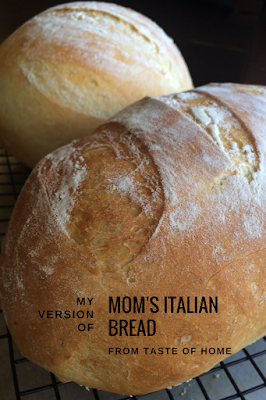 -I always make one traditionally shaped loaf, and then one round. I often freeze the round loaf as it is a perfect size and consistency of bread to hold a baked dip loaf. When I'm hosting an appy night, it's nice to have one in the freezer ready to fill and use. -I haven't done so yet, but I'm going to try making several smaller round loaves from this recipe to be a bread bowl for soup. Again, check out these other reviews for some kitchen inspiration this week!